In 1929, in Chicago, the musicians and friends Joe (Tony Curtis) and Jerry (Jack Lemmon) flees from the night-club where they are playing during a police raid. Without any money, they seek a job position for saxophone and bass players in another band and they are invited to play in a concert for one night only in a distant town. Joe borrows the car of a former girlfriend to travel and when they arrive in the parking garage, they witness the "Saint Valentine's Day Massacre" led by the infamous mobster Spats Columbo (George Raft). The criminals discover Joe and Jerry hidden in a corner and when the killers are ready to execute them, they succeed to escape. Joe and Jerry disguise, dressing like women and they head to Florida by train with an all-girl band using the names of Josephine and Daphne. They get close to singer Sugar Kane Kowalczyk (Marilyn Monroe) and Joe falls in love with her but she believes he is a woman. Meanwhile the millionaire Osgood Fielding III (Joe E. Brown) harasses Daphne inviting her to visit his yacht. When Spats and his henchmen arrive in the same hotel where Joe and Jerry are lodged for a mafia convention, the two musicians feel that they are in a dangerous situation. 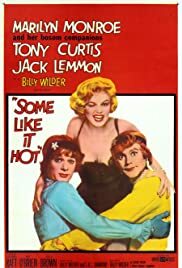 Yesterday Tony Curtis died and I decided to watch "Some Like it Hot" again. This film is another masterpiece of Billy Wilder and certainly one of the best comedies of the cinema history. Jack Lemmon is hilarious and responsible for some of the funniest moments especially when Osgood flirts with Daphne. Marilyn Monroe performs the perfect dumb blonde stereotype. Last time I had seen this movie was on 18 August 2000. My vote is ten.